Anatasia Griffith stars in DEEP STATE as “Amanda Jones,”American, 40s, once the CIA station chief in Jordan and now a highly influential force within the intelligence community. She now runs the CIA side of The Section. Jones is a corporate player, a high-level entrepreneur playing the most high-stakes game imaginable. She’s a good mother to Evie (11) and strives to protect her daughter from the excessive demands of her work. Born in Paris and brought up in London, Anastasia Griffith trained at LAMDA. She starred as “Katie Connor” in FX’s legal thriller series Damages from 2007 to 2009. Ever since, she has enjoyed a successful television career, with roles in Once Upon a Time from ABC, the James Corden comedy The Wrong Mans and NBC’s The Blacklist, to name a few. 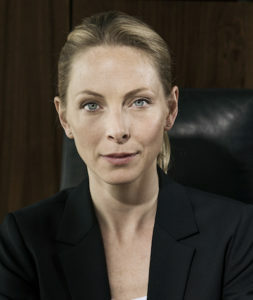 Griffith plays a pivotal role as “Amanda Jones” in the Fox Network Group’s original spy thriller Deep State, starring opposite Mark Strong and Joe Dempsie.